Many of these features can be grouped together in a uniform set of self-driving “levels,” which were defined by the Society of Automotive Engineers in 2014. Although many new car buyers don’t—or won’t—need to know what each level specifically means, it may be helpful to understand the basic principals to understand what system could be right—and what systems may not be allowed by law in their area. Here’s our primer on the SAE-accepted levels, what they mean for new cars, and some examples of systems on the road that would fall into these categories. Level 0: No self-driving features. Many cars on the road today would fall into this category—even when they’re equipped with forward collision warning or blind-spot monitors. Level 0 relies solely on the person behind the wheel to control the car’s functions, including steering, throttle, and brake, while the car is running. Level 1: Some driver assistance. By the book, these cars may have one or more systems that can control speed or steering—but not both simultaneously. Many new cars have available adaptive cruise control, which is an example of a Level 1 feature. By 2021, an overwhelming majority of new cars sold in the U.S. will feature automatic emergency braking, which is also a Level 1 feature. 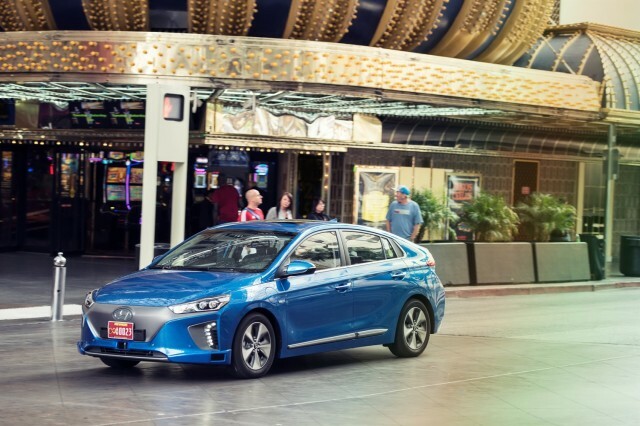 Additionally, automakers such as Subaru are now making available active lane control on entry-level cars, which can steer a car back into a lane, but those systems aren’t as prevalent as adaptive cruise control. Level 2: Even more driver assistance. Many luxury automakers are now making available Level 2 cars that can control steering and speed simultaneously, without driver interaction for short periods of time (under 1 minute, and in some cases seconds). For now, Volvo, Mercedes-Benz, and BMW all offer Level 2 features, but all three systems require constant that a driver monitor the environment around the car. Perhaps the most well-known system, Tesla’s Autopilot, is a Level 2 feature that measures torque on the steering wheel to ensure that a driver is paying attention. Level 2 cars cannot control a car in all situations, including merging on to a highway or stop-and-go traffic. Level 3: Conditional autonomy. Many automakers such as Ford and Volvo have indicated that they’ll skip this step—and for good reason. 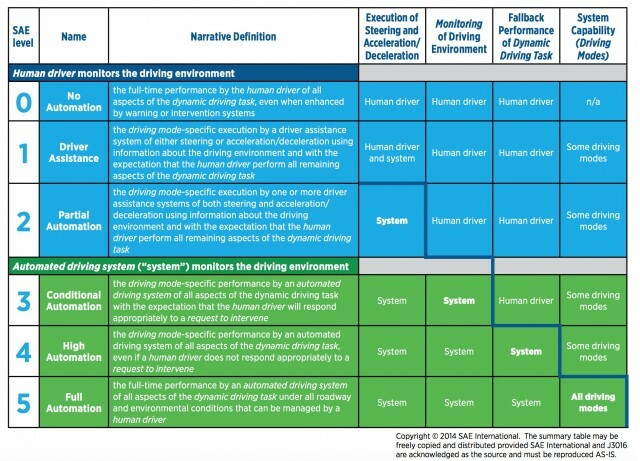 Unlike Level 2 cars, Level 3 autonomy can control a car in all situations and the car is constantly monitoring the road, but unlike higher levels on the SAE scale, Level 3 cars will return to human control if the system can’t function correctly. According to the SAE definition, Level 3 cars will ask drivers to intervene when the self-driving systems fail, but for many automakers that presents a safety problem for drivers who rely too much on the systems and may not be prepared to take over. Level 4: Nearly autonomous. Recently, Ford and Volvo have separately said that they will offer a Level 4 autonomous car before 2021. It’s unclear if those cars will be available to the public, confined to ride-sharing operations, or only available in certain cities, but it’s clear that many automakers are targeting Level 4 autonomy—soon. As a Level 4 car, no driver interaction is needed and the car will stop itself if the systems fail, which is an important distinction from Level 3. Automakers such as Mercedes-Benz and Tesla have already implemented systems that will slow self-driving cars to a stop and engage hazard lights if the driver doesn’t interact with the car. Does this mean you can’t drive a Level 4 car? Not necessarily. But automakers have already indicated that including self-driving features and driver-operated controls (steering wheel, gas pedal, brake pedal) is redundant and costly. Volvo has said it will make a Level 4 XC90 that includes both driver controls and self-driving autonomy, but they’re the only one so far. Level 5: Completely autonomous. The holy grail of self-driving cars might be just as hard to find. Although Level 4 to Level 5 may seem like a small step, in reality it’s a giant leap. Level 5 autonomy takes the driver all the way out of the equation. While the presence of a steering wheel, gas and brake pedals don’t preclude a car from being Level 5, they’d be useless: These cars are not supposed to be driven by people. Getting cars to read roads without clear lines, during bad weather, or in variable conditions is a huge undertaking for sensors and computing power and not likely to be done any time soon. No automaker has laid out a firm timeline for Level 5 cars to hit the road, but many have said that it’s at least a decade or longer away. That’s assuming that they’re even available to the public, which is still unclear.